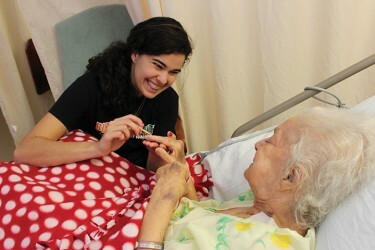 On Saturdays, University of Miami students paint nails, trade jokes and shake up the otherwise routine nursing home activities at Floridean Nursing and Rehabilitation Center in Little Havana. These students are members of UGenerations, an organization that is dedicated to interacting with the older population in Miami. Beginning this semester, members volunteer at the Floridean Nursing and Rehabilitation Center each Saturday from 10 a.m. to noon. Junior Gabriela Lins, vice president of UGenerations, and her team organized a makeshift nail salon in the dining and activity room, the hub of social life at Floridean. Volunteers gave manicures, laughed and shared stories in the dining hall and residents’ rooms with some of the 90 residents who call Floridean a temporary home. “We’re trying to bridge that age gap,” Lins said over a noisy game of dominoes, a pastime for Floridean residents. Lins and senior Caroline Williams, who serves as the UGenerations president, were inspired by their grandmothers to start the club. They were close to them and wanted to share that connection with students at UM. The club officially began during the fall of 2013. COSO approved the organization nearly a year ago. “I realized that other grandchildren at UM must feel the same way,” Williams said. But Williams stresses that UGenerations is more than a service opportunity – it’s about forming significant connections with older generations. Right off Flagler Street on 32nd Place, the Floridean is a facility for those who seek rehabilitation and care after leaving the hospital. “It’s just like being home,” said Anais Ballate, the Floridean’s activities and restorative director. She makes sure that residents, who range in age from 60 to more than 90 years old, are comfortable and are not bored during their stay. Kelley Rice-Schild is the executive director of the Floridean and is a descendant of the original owners Jack R. Rice and wife Julia. According to the Floridean’s website, the nursing home is the oldest in Miami and a “rarity” among chain-operated nursing homes. Ballate organizes the residents’ schedule of activities that include dinners for all occasions like Valentine’s Day and the Super Bowl, field trips to local parks such as Matheson Hammock Park and Beach, and gardening and cooking classes. Despite all the distractions, residents still look forward to a simple conversation, especially with younger people. Just sitting by a few members and residents, each conversation was a window into a life, 80 and 90 years in the making. Ramona Faceda has stayed a month at Floridean, and already knows the ins and outs of residents and visitors alike. She is glad to be part of this small but “caring” community. Faceda emigrated from Cuba and has been living in Miami for 40 years. Now, at age 80, she continues to enjoy showing visitors the fruits of her labor. Junior Rongrong Wu met with Chinese resident Viola Chen who had only been at Floridean for three days. Wu got Chen to smile for the first time in a while, Ballate said. Wu initially joined UGenerations to learn more about Miami’s local culture. Many of Floridean’s residents have been in Miami for more than 20 years, and a large number are Cuban exiles. Upstairs, before heading back to campus, Lins and members went to visit Judith Warner. They met with her in the improvised beauty salon with photos of Audrey Hepburn and Marilyn Monroe hanging on the walls. Originally from Stone Lake, Wis., Warner came to Miami 15 years ago to be closer to her daughter who bought her a condo in the outskirts of Homestead. Lins was surprised to find out that Warner worked as a teacher in a Native American reservation. “I used to be known as the ‘Albino Indian,’” Warner said. Warner moved to the Floridean because she could not continue to stay alone. She felt “therapied out” from the multiple rehabilitation treatments that were required after each of five spinal surgeries. For Lins, young people should have the opportunity to “tap into wisdom” from individuals like Warner. “We wanted for the elderly and young people to communicate,” Lins said. Aside from Saturday visits to Floridean, Lins hopes the club can expand their reach to students. She applied and received funding from the Butler Center to organize a Valentine’s Day event from Feb. 10 to Feb. 11 at the University Center breezeway. Contact: Email umugenerations@gmail.com and visit the Facebook page at on.fb.me/1bOqrfw.